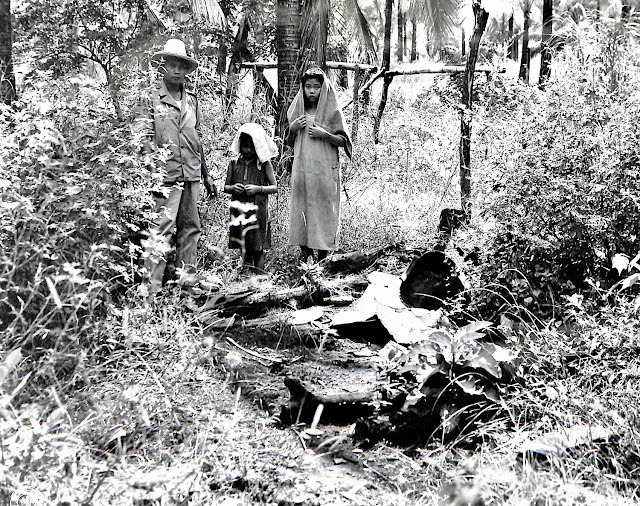 A family in Lipa, Batangas in 1945 stand near their former home, which was burned down by the Japanese. Image source: United States National Archives. Not contented with murder, the Japanese late in World War II in Batangas also burned houses, depriving already miserable citizens of shelter. The most tragic thing about these atrocities was that these were committed against mostly civilians who had little or nothing at all to do with the war. Original Caption: The Dimaano family stands at the site of their former home, which was burned by the Japs at Lipa, Batangas, Luzon, P.I. (for Philippine Islands).